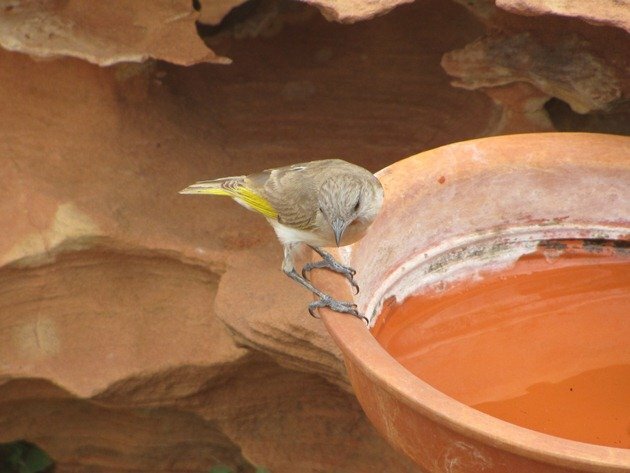 While we are away in the Southern Highlands trying to keep warm and enjoying the bird species of that area I will share with you some of our local Broome birds. 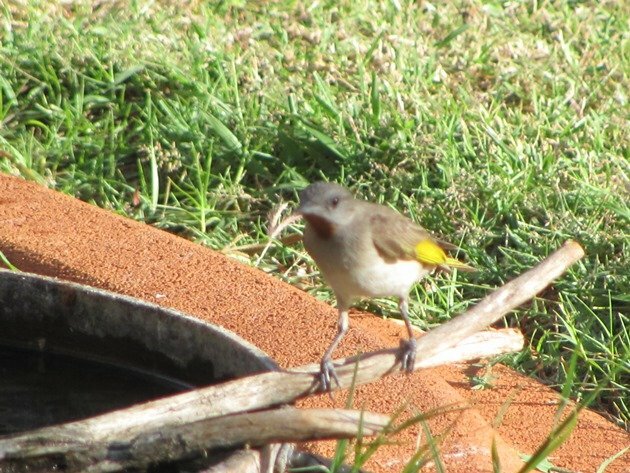 One of the hardest of the Honeyeaters to photograph in our garden is the Rufous-throated Honeyeater. They are more likely to be diving into our water baths than just drinking and even when they do drink they are fast and a real challenge. 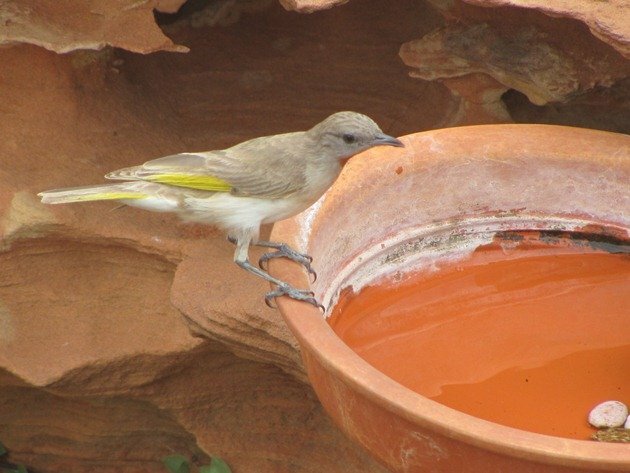 The Brown Honeyeater can look similar from a distance, but the Rufous-throated Honeyeater does not have the little bit of white just behind its eye. The adult birds carry the rufous throat and it is often quite a bright colour. 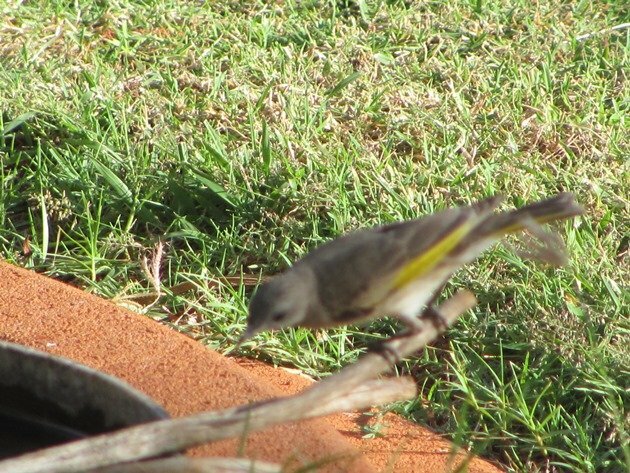 The yellow on the wing feathers is brighter than that of the Brown Honeyeater, but their size is similar. 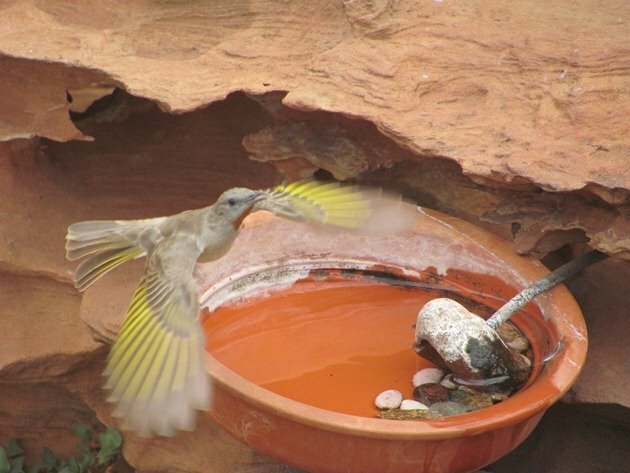 Both species are in the north of Australia, but the Brown Honeyeater is present over much of the southern area as well. 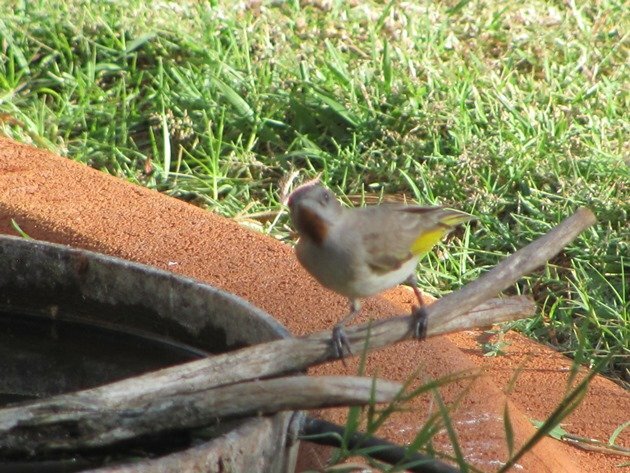 My attempts at photographing Rufous-throated Honeyeaters were stalled at this stage until recently……and you can blame the camera operator rather than the camera! Yes, that header photograph is bad!! These next two are as well, but isn’t that the whole point of not giving up! Finally everything lined up and I got some photographs of a Rufous-throated Honeyeater that showed the features you are looking for! I didn’t use any fancy “sport” programme, but just “winged it” and got lucky! Sometimes you just have to lie on the grass with the camera aimed and wait! Well, because of this post, I realized that 9 years ago I misidentified a Brown as a Rufous-throated. My list is now corrected. Thanks!